Runes are symbols that each carry unique universal energy. These special symbols were used by Nordic and Germanic cultures in Northern Europe as forms of language, for religious purposes, and as tools of magick and divination. 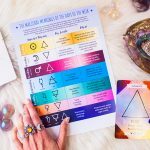 Runes an extremely versatile spiritual tool. 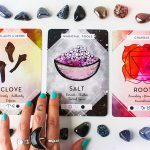 You can use Runes together as a set, like an oracle card deck, learn more about using Runes in this way here. You can also hone in on the energy of specific Runes for specific purposes, that’s what I’ll be covering here. Most Rune sets are comprised of 24 Rune characters, though this can vary some depending on the set used. I’ll be referencing five of the most frequently used Elder Futhark Runes here. The cards shown in the images and rituals are both from The Ritual Deck®, and oracle card deck I created based around ritual. Shop The Ritual Deck® here. The Runes I’ll discuss today are Algiz, Fehu, Berkano, Wunjo, and Tiwaz. Keep scrolling for ways to tap into the energy of each one. Think of Algiz as a spirit guide or connection to your Higher Self always watching over you. This Rune is not only a symbol of protection but goes much deeper and wants to offer you guidance on your journey. 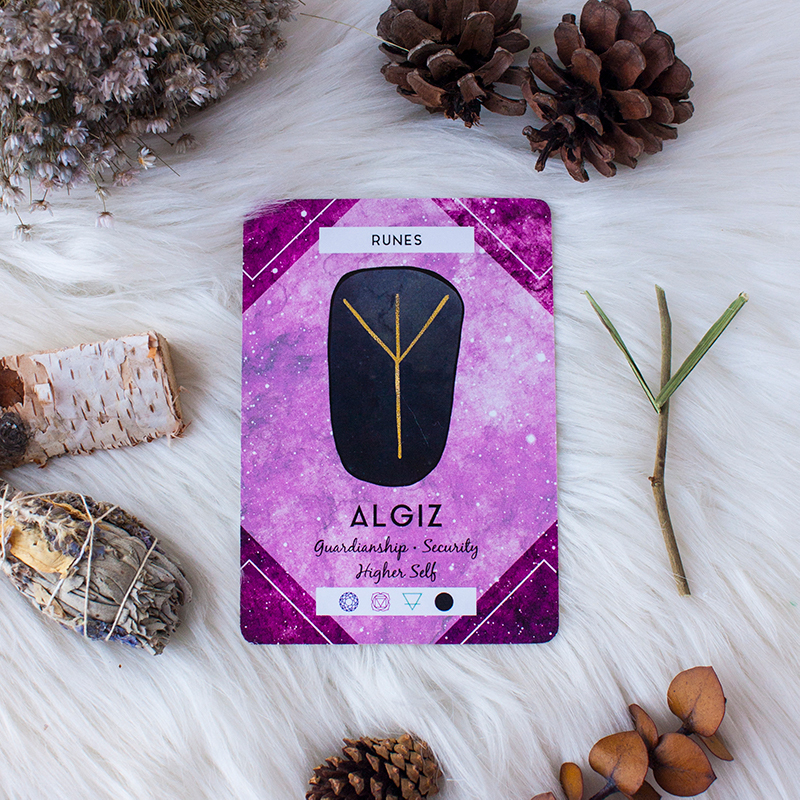 Tap into the power of this Rune anytime you’re feeling lost, scared, or like you need additional protection. Create an Algiz wall hanging to protect you and to remind you of your connection to your Higher Self. 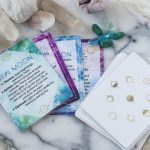 This activity is ideally performed on the night of the dark moon, but it can be done during any moon phase. You’ll need one long stick (this will be used as the center of the Algiz symbol, so any size you’d like will do), two shorter sticks that are the same size (about half the size of the longer stick), and string. Place the two shorter sticks in a “V” shape at the center of your longer stick. The wall hanging should look similar to the Algiz symbol on the card. Wrap your string or twine around the three areas where the sticks meet until they’re stable, and then tie a knot. You can hang this symbol on your wall or place it on your altar. If you are interested in creating another wall hanging for protection, check out this past blog post. Fehu is here to shower you with abundance! This is your Rune for bringing abundance of all kinds into your life, whether it be financial or other. 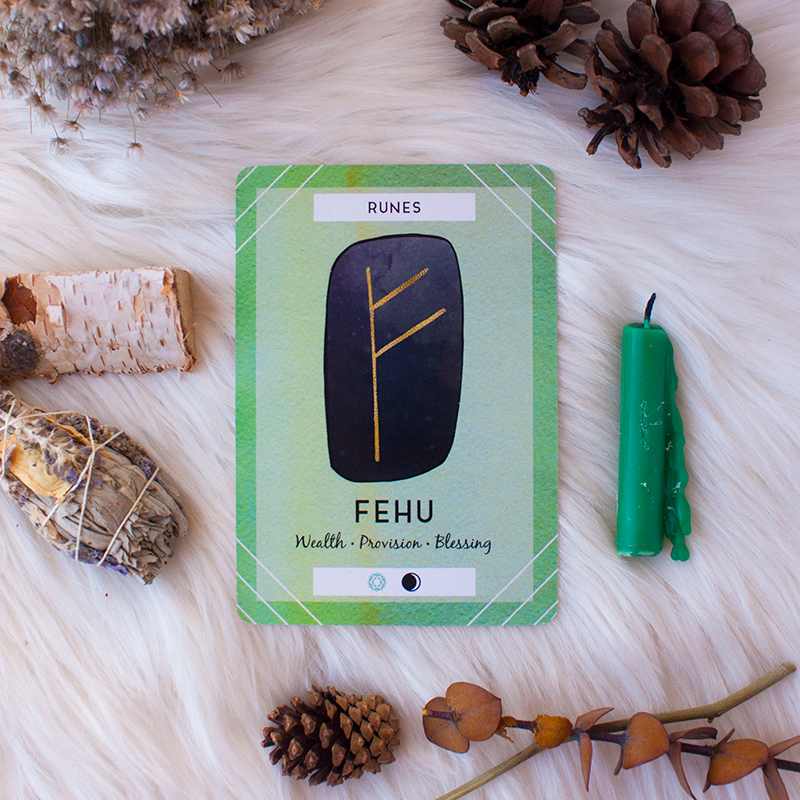 Fehu can also be used as a useful tool to tap into the abundance already surrounding you. If you’re having a difficult time tapping into gratitude for all of the gifts you already have Fehu can help fill your heart with gratitude for all of the abundance you already have. During the next waxing crescent, or any growth phase of the moon, create a Fehu carved candle. You’ll need a green candle, a toothpick, and a lighter. Using the toothpick, carve the Fehu symbol into your candle. As you carve the symbol, imagine yourself being showered with wealth, provisions and blessings. If your well is already full, think about your gratitude for all of your blessings as you carve the candle. Light your candle and gaze at it for short while, inviting the energy of Fehu into your space. Extinguish your candle when you’re done. Light this candle as often as you’d like throughout the waxing moon phase until the full moon. Bring your gifts and goals to life with the help of Berkano. This Rune is all about birthing new things into the world, this could quite literally mean birthing a child into the world or a new project. Whatever it is you’re trying to bring to fruition, Berkano is here to help bring it to light. 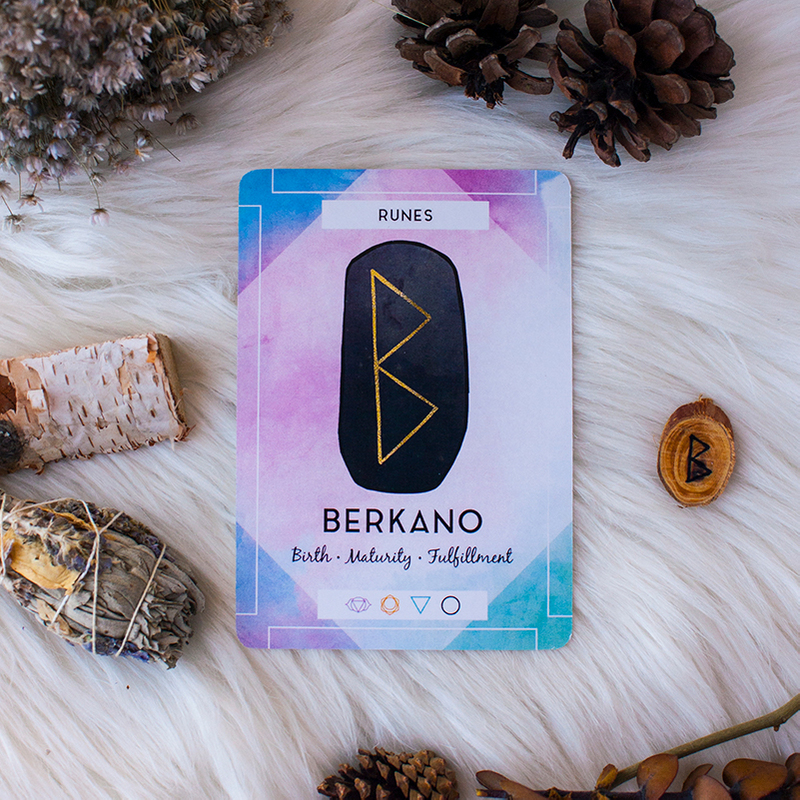 To connect with the energy of Berkano, create your own Berkano charm during the next full moon. You’ll need a medallion of wood or a small stone, and paint or a permanent marker. Visualize the goal or desire you’d like to fulfill as you draw or paint the Berkano symbol on your wood medallion or stone. Once you’re done, take a few quiet moments to visualize what you’ll feel like when your goal is manifested. Place your Berkano charm somewhere you’ll see it regularly, or carry it with you. 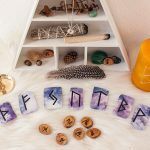 If you would like to learn more on manifesting with runes, click here to read a past post. Need more reasons to smile? 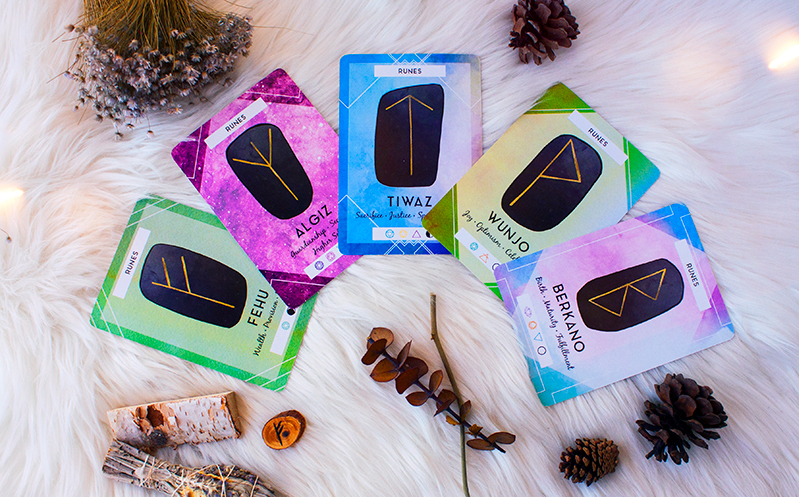 The Wunjo Rune is here to help you make the decision to live in joy. This is a great Rune to use if you’re feeling down or anxious because it will help you see the good in things around you even if you’re going through a hard time. Create an altar or sacred space for Wunjo as a reminder to find the joy in each day. You might find that Wunjo’s jubilant energy starts to bring more optimism into your daily thinking. This is a great ritual to perform on the day or night of the full moon. 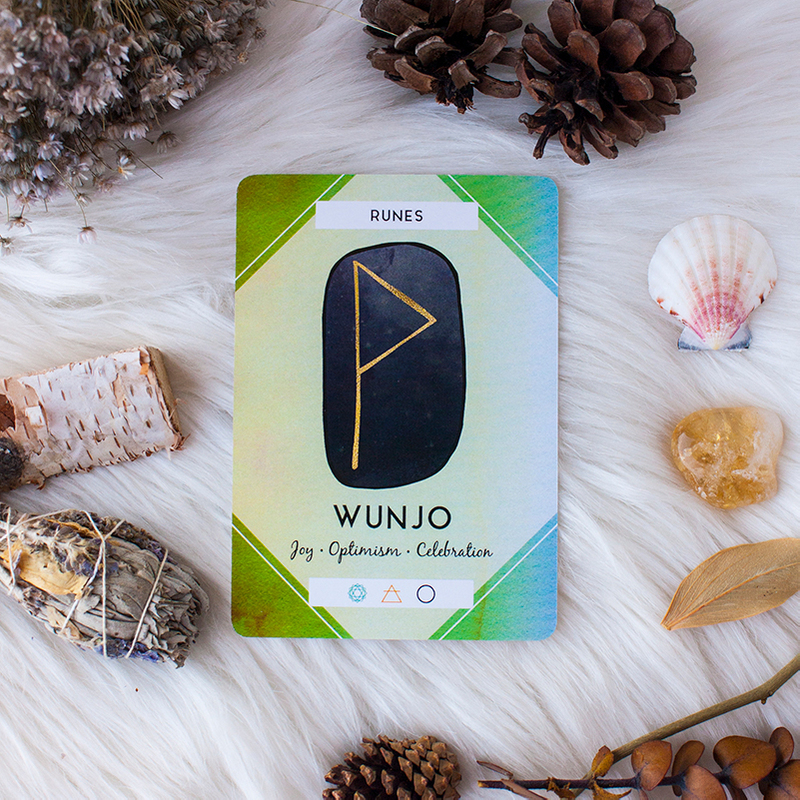 Use the Wunjo card fromThe Ritual Deck® or draw it on a card to place on your altar. Collect objects that bring you joy, such as pictures of happy memories, joyful flowers, or trinkets that make you happy. Other items to consider are green aventurine and a yellow candle. Get creative and have fun with this! Your Wunjo altar should make you smile anytime you gaze at it. Keep this altar up for as long as you’d like and try to make contact with it daily for one complete moon cycle. 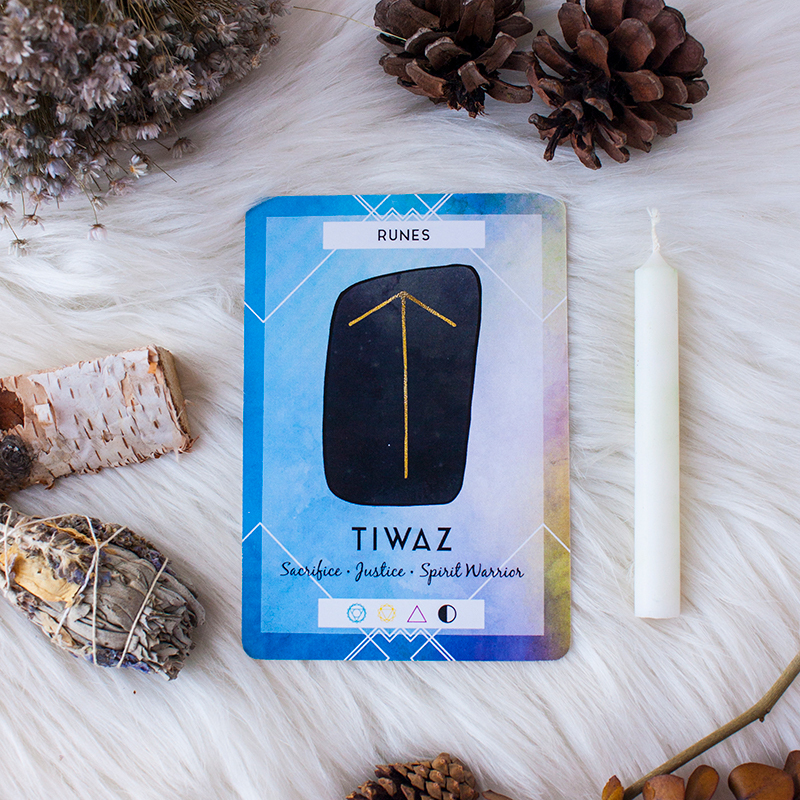 If you’re going through a challenge with another person or have a difficult decision on the horizon, Tiwaz is here to help you through it. Consider this Rune the warrior Rune. The energy of Tiwaz wants to help you find truth and justice, which is not always easy. Rely on the strength of Tiwaz for help during disagreements, legal battles, or making difficult decisions. Create a Tiwaz candle for any disagreements, difficult decisions, or legal encounters you have coming up. If you need a fresh look at the situation a white candle will serve you well. If you need momentum to help you make a difficult decision a red candle will serve you well. During the next first quarter moon or any waxing moon phase, gather your candle, a toothpick, and a match or lighter. The addition of a sodalite stone will help for speaking your truth and a tiger eye stone for energizing your solar plexus chakra. Carve the Tiwaz symbol into your candle and light the candle. Invite the just energy of Tiwaz into your situation. Sit with the lit candle as long as you like, and once you’re finished extinguish the candle. Continue to sit with the candle daily until the moon grows full, you’ve reached a decision, or your issue is resolved. If you’ve enjoyed these Rune rituals find more in The Ritual Deck® here. The Ritual Deck® offers more tools for ritual along with rituals for even more Rune symbols! 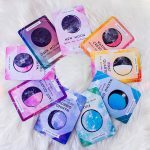 What crystals, symbols, and scents do you need most?